Output = GetTimeAsText() & " "
In part 1 of this series I showed how to use Power Query to extract Extended Event data generated by SSAS. Having done that, I now want to show the first (I hope of many) examples of how this data can be used for performance tuning: analysing activity in the Storage Engine, the part of SSAS that reads data from disk and aggregates it up. 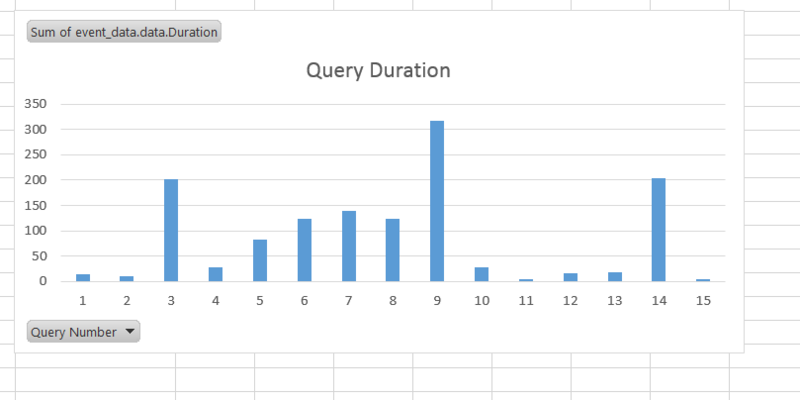 Though it’s hard to see the details at this resolution, the yellow line is the Query End event associated with the query, the grey lines are the Query Subcube Verbose events associated with the query, and the brown lines are the Progress Report events associated with each Query Subcube Verbose event. Looking for times when there are a lot of queries running simultaneously – and which, as a result, may be performing poorly. Looking for long-running Query Subcube Verbose and Progress Report End events which could be optimised by the creation of aggregations. Visualising the amount of parallelism inside the Storage Engine, in particular the number of Progress Report End events that are running in parallel. This would be very interesting for queries using distinct count measures when you are testing different ways of partitioning your measure group. Highlighting situations where calculations are being evaluated in cell-by-cell mode. When this happens you typically see a very large number of Query Subcube Verbose events being fired off within a query. I’d like to stress once again that the object of this exercise is not to show off a ‘finished’ tool, but to show how Power Query, Power Pivot and Excel can be used for self-service analysis of this data. This workbook is just a starting point: if you wanted to use this on your own data it’s extremely likely you’d need to change the Power Query queries, the Power Pivot model and the report itself. Hopefully, though, this workbook will save you a lot of time if you do need to understand what’s going on in the Storage Engine when you run an MDX query. Today Power Query is available only to people who have Excel Professional Plus or Excel standalone, but as of May a version of Power Query will be available on every Excel SKU. There will be some limitations around data sources that are supported if you don’t have Excel Professional Plus, but that’s ok – this change will make it much easier for people to learn about and use Power Query, and I’m really happy about that. Other new features coming in the May update of Power Query include the ability to turn off prompts about native database queries (useful in this scenario, for example), OData v4.0 support, the ability to use alternative Windows credentials to run queries, and a couple of new transformations such as removing empty rows. Excel 2016 – where Power Query is now native to Excel – will have support for creating Power Query queries using VBA and macro recording. I understand you won’t be able to edit individual steps in a query, but you’ll be able to create and delete queries programmatically and change where they load their data too. Excel 2016 will also support undo/redo for Power Query and give you the ability to copy/paste queries (even from workbook to workbook). There was a commitment that Power Query in Excel 2016 will keep getting updates on a regular basis, rather than get tied to the much slower Office release cycle, so it retains parity with the Power Query functionality in the Power BI Dashboard Designer. It’s not your normal Power Query session about self-service ETL – instead it’s about using Power Query to create a SSRS-like reporting solution inside Excel. This is a topic I’ve been thinking about for a while, and while I have blogged about some of the tricks I show in the session (like this one about using slicers to pass parameters to Power Query) there’s a lot of new material in there too that should interest all you Power Query fans. The other day, while I was reading this post by Melissa Coates, I was reminded of the existence of extended events in SSAS. I say ‘reminded’ because although this is a subject I’ve blogged about before, I have never done anything serious with extended events because you can get the same data from Profiler much more easily, so I had pretty much forgotten about them. But… while Profiler is good, it’s a long way from perfect and there’s a lot of information that you can get from a trace that is still very hard to analyse. I started thinking: what if there was a tool we could use to analyse the data captured by extended events easily? [Lightbulb moment] Of course, Power Query! What I want to concentrate on in this series of posts is how to make sense of this data using Power BI in general and Power Query in particular. The first step is to be able to load data from the .xel file using Power Query, and that’s what this post will cover. In the future I want to explore how to get at and use specific pieces of text data such as that given by the Query Subcube Verbose, Calculation Evaluation and Resource Usage events, and to show how this data can be used to solve difficult performance problems. I’m only going to talk about SSAS Multidimensional, but of course a lot of what I show will be applicable (or easily adapted to) Tabular; I guess you could also do something similar for SQL Server Extended Events too. I’m also going to focus on ad hoc analysis of this data, rather than building a more generic performance monitoring solution; the latter is a perfectly valid thing to want to build, but why build one yourself when companies like SQL Sentry have great tools for this purpose that you can buy off the shelf? This function can be thought of as the starting point for everything else: it allows you to load the raw data necessary for any SSAS performance tuning work. Its output can then, in turn, be filtered and transformed to solve particular problems. The name of a SQL Server relational database instance – this is because I’m using sys.fn_exe_file_target_read_file to actually read the data from the .xel file. I guess I could try to parse the binary data in the .xel file, but why make things difficult? All that’s happening here is that the function is being called in the first step, Source, and then I’m filtering by the Query End event, expanding some of the columns in event_data.data and setting column data types. You won’t need to copy all this code yourself though – you just need to invoke the function and then expand the event_data.data column to reveal whatever columns you are interested in. When you run a query that calls this function for the first time, you may need to give Power Query permission to connect to SQL Server and also to run a native database query. Not very useful, for sure, but in the next post you’ll see a more practical use for this function. There’s a lot of detail, including examples (although the ConcatenateX() page isn’t live at the time of writing – but I’ve blogged about that already), so it’s well worth reading through.